Using our RESTful API and native integrations, developers and users can easily move data between WorkBoard and other business applications. Excel (and other .csv files) — use the pre-built connector and follow the directions to enable automated input of specific information into WorkBoard. 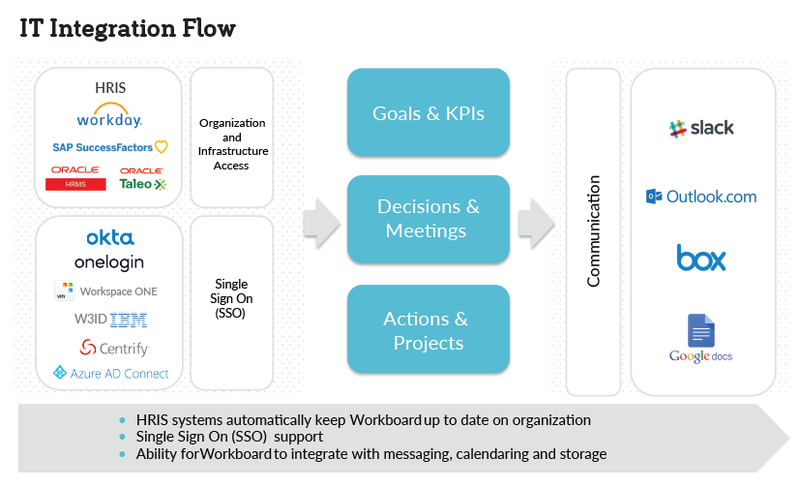 Calendaring — automatically update and exchange calendar events between WorkBoard and Outlook and Google Cal using native applications provided by WorkBoard. Development management — JIRA — push statistics about development milestones and deliverables directly into WorkBoard as metrics (% complete, # tasks/person, velocity-speed of completion). Display summary status of projects in progress. Task management — Asana — push statistics about tasks and deliverables directly into WorkBoard as metrics (% complete, # tasks/person, velocity-speed of completion). Trouble ticketing — ServiceNow — push statistics about tickets directly to WorkBoard as metrics (# of tickets/person, avg. time to close tickets, or tickets in specific state). CRM — Salesforce.com — push statistics about monthly revenue, bookings, pipeline and % quota attainment directly to WorkBoard as metrics. 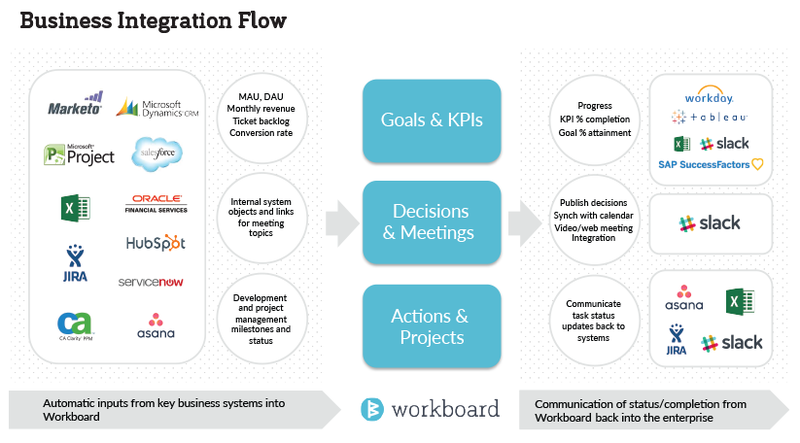 Marketing automation — Marketo and Hubspot — push statistics about leads generated, handed off and/or closed directly to WorkBoard as metrics.